Dreams nearly fulfilled, Thank you Fujitsu,,, NOW GIMME my lappy!!! You know as a kid, a slightly balding man, or a woman, you always wanted a Ferrari, admit it. Well computers are kind of the same; you always wanted power, monstrous power, and a convenient, easy way to interact with it. Well for many of you, that occurred in the past few years when laptops embedded with wireless functions and large amounts or ram and power, enabled programmers, and businesspeople alike to do nearly anything and everything they’ve wanted to. Alas, for those in the art and design world this has not yet truly been the case. While Wacom released their beauteous and wonderful Cintaq (it’s a stylus/screen combo so you can draw on the screen), one of the best innovations for the power design user ever seen. Sadly this monitor/tablet interface hasn’t truly been available in a powerful laptop configuration, only as a desktop. Yes, there are tablet PC’s (Apple are you listening?!) but they are all underpowered for the uses the design and art world are searching for. When spinning a 3d model, or working on a 400 meg Painter or Photoshop file, the power to do that was never in a gigahertz and a half laptop with 3 hours of battery power and half a gig of ram. 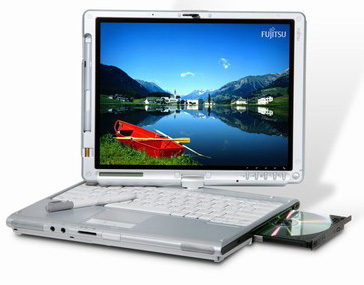 Fujitsu just released the specs on their next dual core duo laptop. These units will have up to 4 gigs of ram. Let’s just hope they’re smart enough to beef up the video cards to match what the rest of the machine can really do. Thank you in advance to all the companies, finally making dual core laptops with tablet interfaces. Finally the magic we’ve always been promised! Now just put them in stores please!! !